Chelmsford 123 is a sitcom based in England in the year 123 A. D. This comedy is about the tug of war between the British Chieftain and the Roman Governor of the province at that time. Rome invaded and held England for years. This show makes this historic episode into a comedy beginning with the Roman Governor who was exiled for making fun of the emperor's horse. Now, instead of living in beautiful Rome, he must suffer in wet, cold England. 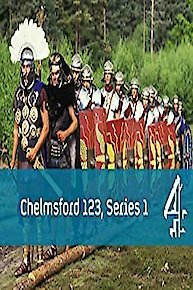 The viewers will get a comic look at the history and differences of both Rome and England in 123 A. D.
Things are quiet in Chelmsford. Too quiet. Aulus hasn't heard anything of Badvoc for weeks, which can only mean one of two things; either Aulus has gone deaf or Badvoc is up to something. Badvoc attempts to relieve Aulus Paulinus of a priceless ring and use it to exact sexual favours, incurring the wrath of the governor's wife Marcella. A great heatwave hits Chelmsford, giving the Romans an opportunity for to top up their tans and Britons to die of thirst. It gets so bad that Badvoc has to cancel his annual bath. Aulus seeks psychiatric help and is found to be suffering from a rare stress-related disease called 'living in the same town as Badvoc'. Aulus decides to liven up Chelmsford with the Festival of Saturnalia. As part of the revelry, a fool is made king for a day - and so the Romans naturally choose Badvoc. Badvoc is kidnapped by the terrorist tribe of the Triconi. Aulus is urged to rescue him to prevent civil war, but he has designs on Badvoc's beautiful girlfriend. Governor Aulus decides to give the people of Chelmsford a new Roman road and he wants to give it to them straight. But Badvoc insists on a bypass around the holy town of Romford. Aulus is suffering from nightmares and insomnia. Could it be the staple all-day British breakfast of pig and egg, or is some disaster about to befall him? Episode 2 - What's Your Poison? Aulus Paulinus tries to improve Romano-British relations by conducting a walkabout up and down the open sewer that is Chelmsford's high street. Aulus Paulinus insults the Emperor's girlfriend and is sent to Britannia. He then meets Britain's tribal leader, Badvoc.